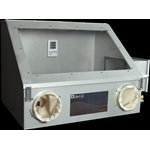 Our Glove Boxes are hard shell units constructed of aluminum with durable powder coated surface inside and out. Slanted acrylic window allows ample light for working in the chamber; dual latch front door insures a tight seal. Side entry and interior door can be used to place items into chamber after unit is purged. Comes complete with hygrometer and polypropylene spill tray. Ideal for isolation, containment barrier and where an inert atmosphere is required. Aluminum Glove Box 24" x 20"
Aluminum Glove Box 27" x 20"
Aluminum Glove Box 34" x 20"